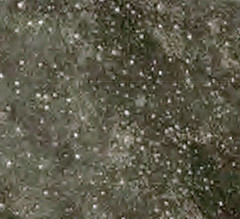 Comparing two aerial images from the Badlands, viewed via GoogleMap. 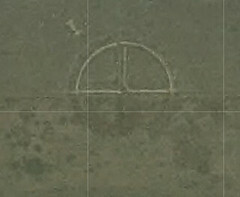 One is a bombing target carved into the earth by the military (the bottom portion of the target is less visible, so it may be grazed now, and if so, I am guessing there is a cattle-fence running through the center of the old target). The other location is a Sundance (ceremonial) site. Sacred and Profane; within field-glass view of each other. It is hard to shift our perspectives. Try walking around all day looking at the world through a magnifying glass. The fact that we can see our daily terrain from the perspective of plane-photos and satellite imagery is really a major paradigm-shift. 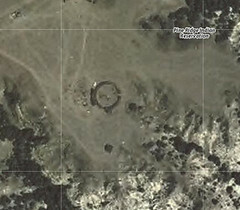 Here is an aerial view of the Minuteman Missile Silo I visited, just north of the Badlands…. 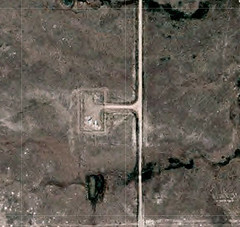 and the aerial view of a Badlands prairie dog town. I am really amazed that all of these patterns are so strikingly visible at such distances.